The eight men who disappeared from the city's Gay Village were honoured with a moment of silence. 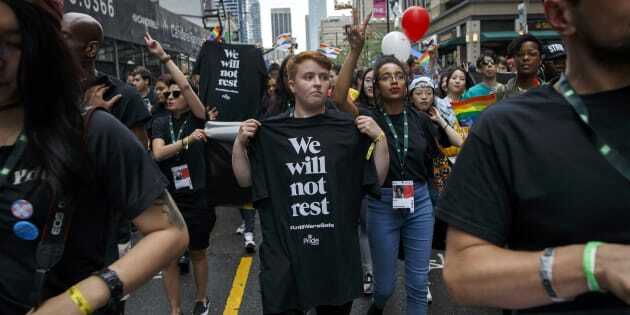 As a tribute to those lost from the community, people march with We Will Not Rest #UntilWe'reSafe posters and t-shirts during the Toronto Pride parade on June 24, 2018. TORONTO — Crowds of people filled the streets of Toronto on Sunday to celebrate the annual Pride Parade, though the tone was subdued at times by tensions between the LGBTQ community and the city's police force. More than 120 groups marched along the rainy downtown route in this year's parade — but uniformed officers are not among them. Earlier this year, members of the LGBTQ community accused Toronto police of failing to seriously investigate the disappearances of men linked to the city's gay neighbourhood for years — until January, when 66-year-old landscaper Bruce McArthur was arrested and subsequently charged with eight counts of first-degree murder. People marching in the Toronto Pride Parade on June 24, 2018. Mike Morris, a 29-year-old nursing student who came to the parade bare-chested and in a rainbow Speedo, said the allegations against McArthur and strain between the community and police reaffirmed his desire to attend the parade. He said the LGBTQ community needs to come together during "difficult situations." Tensions involving police and the parade started brewing in 2016, when members of Black Lives Matter abruptly halted the march to present several demands, among them that uniformed police, their floats and cruisers be excluded. The group cited tensions between the force and black citizens arising from racial profiling, among other things. Foreign Affairs Minister Chrystia Freeland marches in the Toronto Pride Parade on June 24, 2018. This is the second consecutive year uniformed officers have been excluded from marching in the parade, but police are on hand as the streets are flooded with hordes of spectators. Ontario NDP Leader Andrea Horwath wore a black arm band around her wrist Sunday as a signifier of the "poignant" and "painful" moment the community is facing after the deaths of eight of McArthur's alleged victims. "There are still tensions with the police and I believe that dialogue has to continue to happen and that it will resolve with respect from both sides, but those things are part of the context of moving us forward as a province and as a city, and I'm happy to be here and part of that positive revolution," Horwath said. Ontario NDP Leader Andrea Horwath marches in the Toronto Pride parade on June 24, 2018. She marched alongside with federal NDP Leader Jagmeet Singh, who pointed out that Pride is a "revolutionary movement to take space for a community that has always been marginalized." He added that Pride will always be faced with discussions that are sometimes difficult, such as the current ones around the deaths and police. Ontario Premier Kathleen Wynne marches alongside her partner Jane Rounthwaite during the Toronto Pride parade on June 24, 2018. "Love is love, it truly is, but there is so much more that needs to be done ... There's been concerns around a trust that's broken down," he said, calling for the end of carding. "The only way we can have good policing is when there's a trust between the police and the public and that is something we need to have." Singh also said that Howarth's Conservative counterpart, premier-designate Doug Ford, should have been at the parade. "It is not surprising that he's not here," Singh said.